Serving as a source of inspiration and recognition to showcase outstanding genealogy websites, the 2008 Artistry of Genealogy Awards (AGA) recognizes excellence in preserving family history through genealogy. The categories and winners were selected by consumers across the country who had their photo memories digitally preserved by ScanMyPhotos.com. Technology has enhanced the interest in learning about genealogy - the art of studying family history and investigating the ancestry of a family tree. 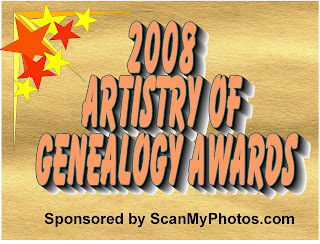 While there are tens of thousands of Blog postings and websites dedicated to genealogy, The Photo Preservation Center - an educational division of ScanMyPhotos.com - has commissioned a study to reveal the very best sites and is announcing the winners of the 2008 Artistry of Genealogy Awards. "The 2008 Artistry of Genealogy Awards was planned to coincide with April’s ‘The Great American Photo Scanning Month’ to encourage having the 3.5 trillion analog photo snapshots digitally preserved," said Mitch Goldstone, Chairman of the Photo Preservation Center and president and CEO of ScanMyPhotos.com, AGA’s sponsor. 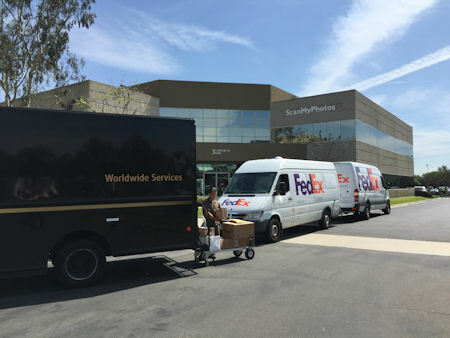 "As generations of family photos begin to fade away, our goal is to promote photo scanning, 'The Great American Photo Scanning Month' promises to inspire many people to have their photos digitally scanned," said Goldstone. Throughout April, ScanMyPhotos.com is providing 1000 free photo scans to members of four leading social networking sites. Along with all members of each website recognized by the AGA’s, Flickr, MySpace, Blogger and Facebook members can have up to 1,000 4x6" photos scanned to DVD without charge when they mail their pictures to ScanMyPhotos.com and pay $19.95 for return S&H and include the downloadable order form. The 2008 Artistry of Genealogy Award winners was selected during a telephone survey of 945 ScanMyPhotos.com customers across the nation during January 12 - March 24, 2008 who identified their favorite websites for each of the below categories. See Tales from the World of Photo Scanning: [www.blog.ScanMyPhotos.com] for complete listing and descriptions. Best Family Immigration Story Site: Tell Us Your Story - The Ellis Island Immigration Museum. This site enables sharing your family’s immigration story, when they came to America and why -- the challenges faced in leaving your homeland and settling here, and how your family has become a part of the American Experience. Website: www.ellisisland.org. Background: Photo Preservation Center (PPC) was established by ScanMyPhotos.com as the principal resource for information on scanning digital images and preserving generations of analog photo memories. Its mission is to promote and foster the dissemination of information and host an international resource center for discussing all issues pertaining to the preservation of family pictures. PPC is designed to facilitate the transfer of information and enhance awareness for the growing demand for converting analogy pictures into digital images and promote all the new products available for consumers to view, save and share their photo memories. ScanMyPhotos.com is a division of 30 Minute Photos Etc., founded in 1990 as a retail and nationwide digital imaging Ecommerce business. ScanMyPhotos.com has digitally scanned more than 6-million photographic images.